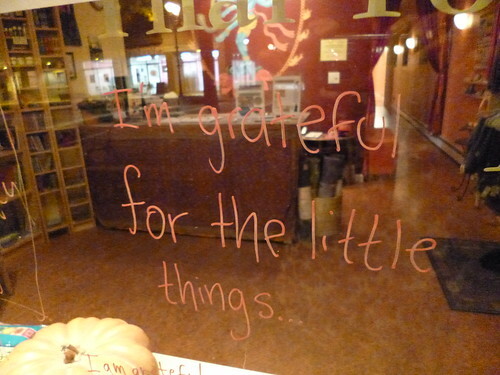 What little (or big) things are you grateful for today? One essesntial hurricane safety tip. I am grateful I know my children are safe. Grateful to the caring parents and catechists at St. Joseph’s Church who did a beautiful job with the 3rd grade saints activity and all the delicious yummies donated for the kids. Thankful for food stockpiled and clear gutters to drain away the rain (hopefully). Thankful to be able to afford things like medications. Thankful for tree roots to soak up the rain. Thankful for the shelter of a warm home. I’m grateful to be able to spend a Monday with my kids and husband tomorrow even if it is due to a massive storm! I am grateful to have been part of Dharmachakra Meditation Center this year. Arrived with the storm last year in time to help rebuild, and here we are again, helping each other prepare for the storm. What a wonderful opportunity each moment gives us! This morning we read the Heart Sutra, then after class we dissolved the center onto cinder blocks, and taped up the doors. And we wait. Be safe, and keep a happy mind:) I am grateful for you Lucila! and also all the things Lucila mentioned. Tonight I had to prepare my staff and students for the storm coming are way. I am grateful to work with strong student leaders who are always willing to lend a helping hand. I am grateful that I can spend the day indoors being lazy with my family. I am grateful to everyone who will help us to make it through the storm and the aftermath like the people who will clear fallen trees, repair utilities, etc.